Book Review: Future Imperfect, ed. by Anthony Downey, Third Text, April 2018. This volume is an extensive anthology that investigates the history and current politics of cultural institutions and production in the Middle East. 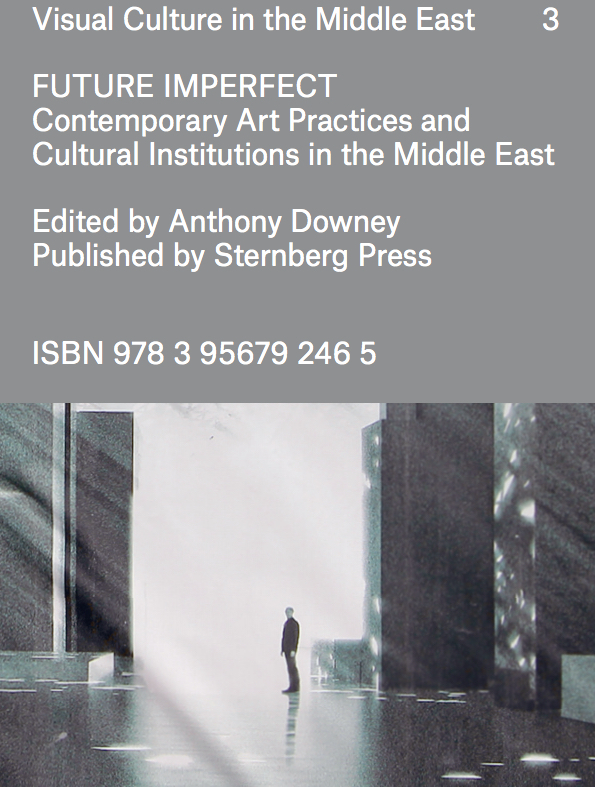 It is the latest addition to the series ‘Visual Culture in the Middle East’ published by Ibraaz, and was preceded by Uncommon Grounds: New Media and Critical Practices in North Africa and the Middle East (2014) and Dissonant Archives: Contemporary Visual Culture and Contested Narratives in the Middle East (2015). The series, which is based on questions raised in Ibraaz’s ‘Platforms for discussion’, attempts to interpret and comprehend how the accelerated regional upheaval, with the social and economic breakdown caused by revolutions, counter-revolutions and civil wars, has echoed in visual and cultural practices in terms of responses to the specific antagonisms, and the developing of alternative structures and models of production while operating in precarious political conditions. And how, simultaneously, cultural production in the region is influenced by the global cultural economy, and perhaps even co-opted, or at least driven by, the politics and parameters of a globalised art market. For the full review see Third Text online review here. Yonamine, The Best of the Best, 2007, installation and video. Courtesy Sindika Dokolo African Collection of Contemporary Art.